Last night I went to dinner where we all brought different courses and enjoyed them together. I was in charge of dessert (what a surprise). The July issue of Good Food has this tart on the cover at the bottom - the recipe looked too good to miss so it had to be the one I made for the dinner. A few days ago I saw these gorgeous peaches at the local store when I was popping in for some milk and couldn't resist buying a few. They were still a bit unripe but by the time it came to making this tart yesterday, they were perfect. 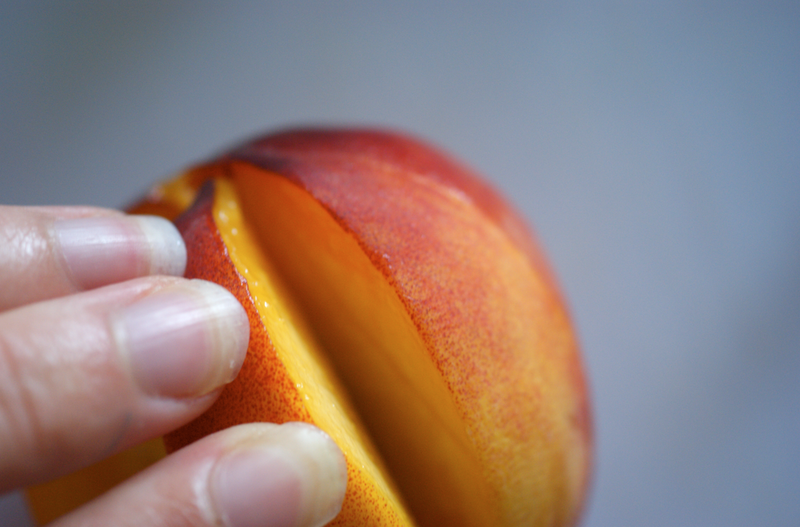 I adore stone fruit, especially peaches, nectarines and apricots. 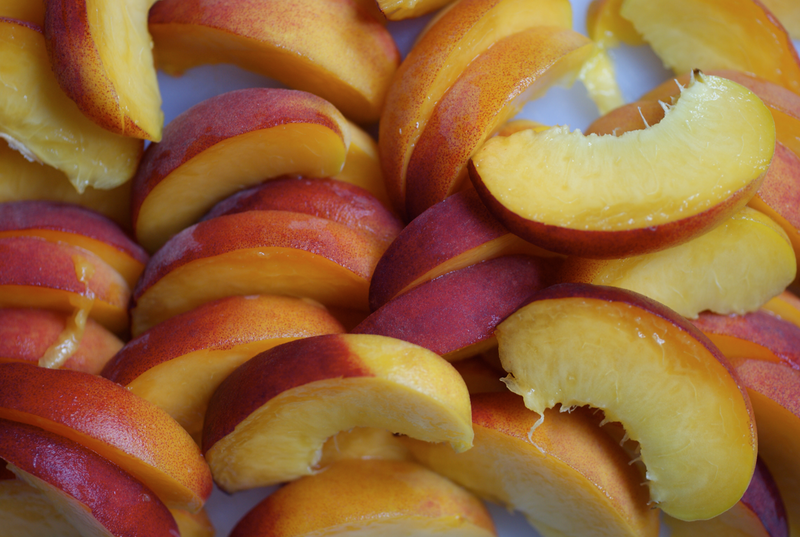 I think one of the most perfectly, heavenly foods upon this planet is a perfectly ripe white nectarine. Peaches have never survived long enough in my house to be baked with, even when we used to buy them by the tray. I'm glad I tried this though - I'll definitely bake with them again. I didn't really like the pastry when I was making it - it seemed so crumbly and odd and then cracked and looked unattractive when baked. 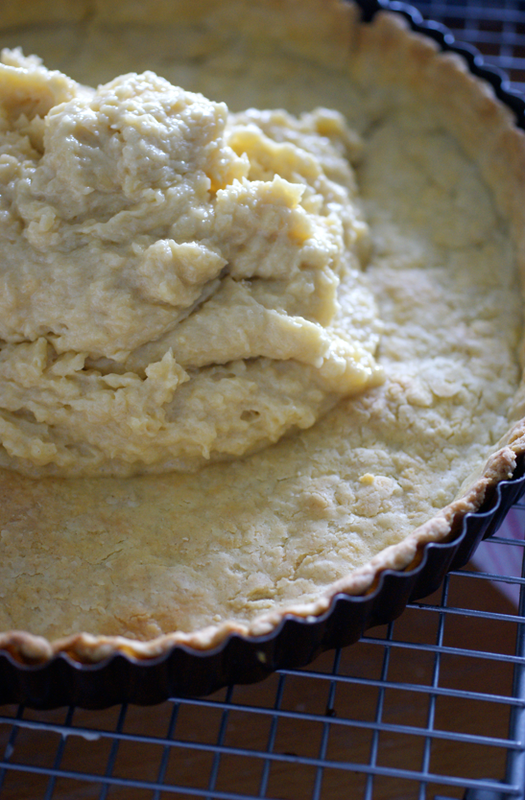 Yet when it was filled with the almond filling and the peaches, the crumbly biscuity pastry worked well. The almond filling is intriguing - it seems a lot like a cake batter without any raising agent. I bought flaked almonds and ground them myself as I think they have more flavour and scent if freshly ground, and I wanted to be able to give a variety with slightly bigger bits of almond as well as finely milled. The recipe suggests that you serve the tart with creme fraiche. I couldn't resist making my creme fraiche side into an ice cream (see my Birthday post about my new ice cream maker...). I had a quick look for recipes but couldn't find anything that suited me, so I adapted the basic custard recipe. I made half the milk based custard and then whisked in the creme fraiche when it was cool. 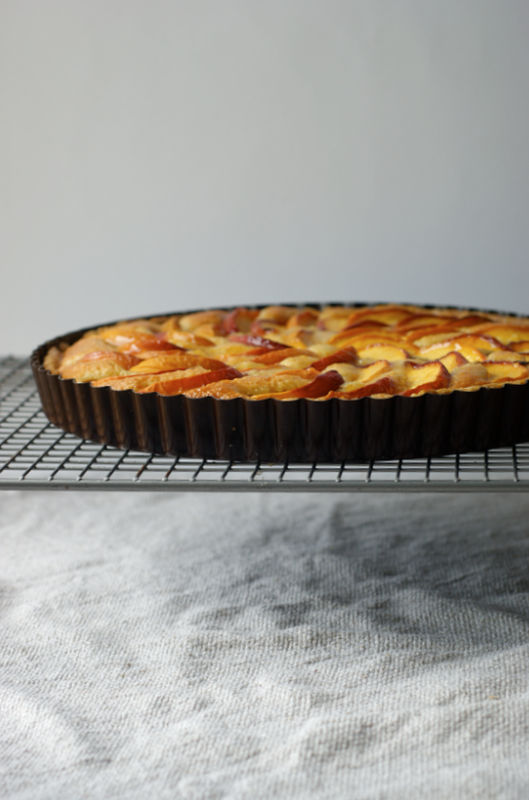 The tart is as good as it looks in the magazine - the peaches are incredible and the almond filling and pastry complement them beautifully. 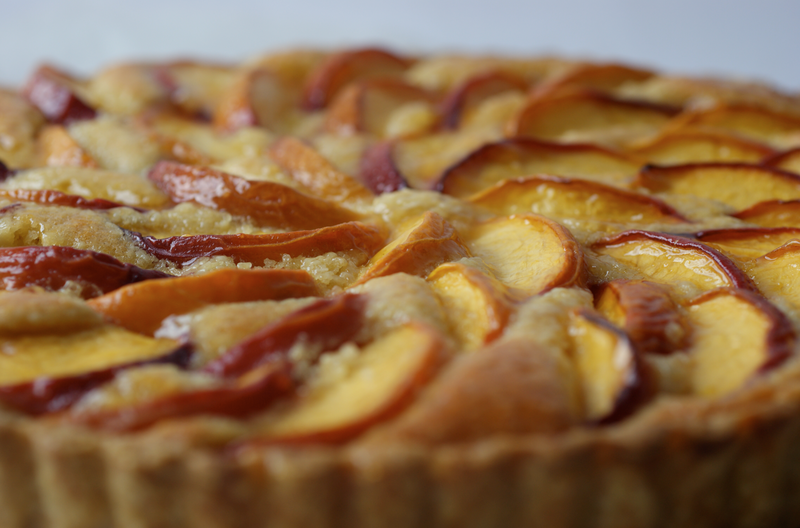 The almost grainy texture of the filling contrasts with the soft sweet peach. The ice cream fills the picture out. It needs to be served very soft - almost melting or like a solid milkshake. 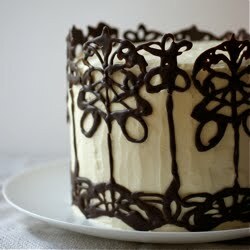 It's subtle and very lovely as an accompaniment - it doesn't interfere, just enhances. Rub the flour and cold butter together, then stir in the sugar. Stir the two egg yolks together with 2 teaspoons of cold water, then add half of it to the bowl and use a knife to mix it in, followed by the other half. Try to bring together and add an extra tsp or two of cold water if needed. It's pretty crumbly. Put in the fridge to rest for 30 minutes. Preheat oven to 180C for fan/200C normal. Roll out on a lightly floured surface and fit into a 23 cm tart case - you can patch it up if needed. Line with greaseproof paper and fill with baking beans and bake blind for 10 minutes. Remove the paper and beans and prick with a fork. Return to the oven for about 10-15 minutes until golden and biscuity. 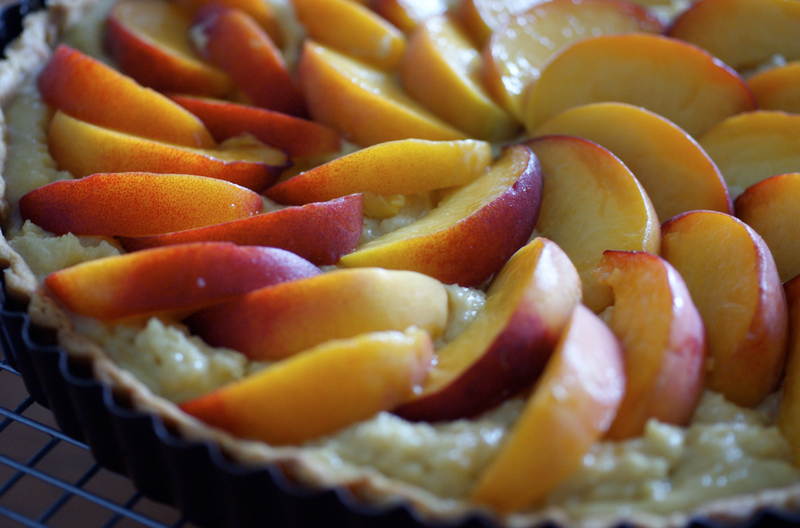 While the pastry bakes, you can make the filling and slice the peaches. To make the filling, cream the butter and sugar together, then add the eggs one by one. Fold in the flour and ground almonds. Spoon into the warm pastry case and spread out. Arrange the peach slices on top. Put into the oven for 30-40 minutes until browned. 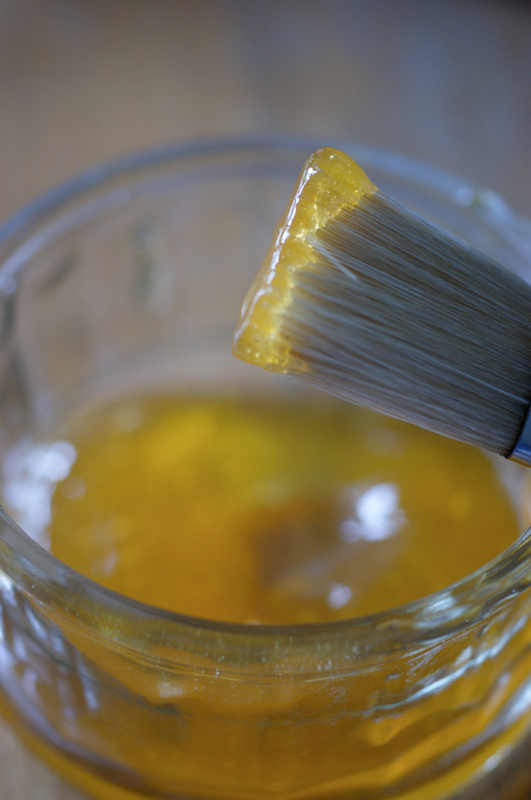 When slightly cooled, mix the jam with a tsp of boiling water. Sieve, then brush over the top of the tart. Serve either warm or at room temperature. Heat the milk till boiling. Beat the yolks and sugar together then add some of the milk, still beating. Return to the pan and stir until it coats the back of a spoon. Allow to cool, then beat in the creme fraiche and lime juice. Use according to the instructions with you ice cream maker. Serve very soft. Makes about a pint. This looks lovely. I've seen the July issue of GF and the cover was so enticing. I love how you mixed up the creme fraiche - so inventive! Gosh, this looks fantastic. Truly beautiful. Sounds like a wonderful recipe, and you sure did it justice. Love the addition of creme fraiche ice cream. Your photos, as always, are just gorgeous. Now, I have no idea what to do! 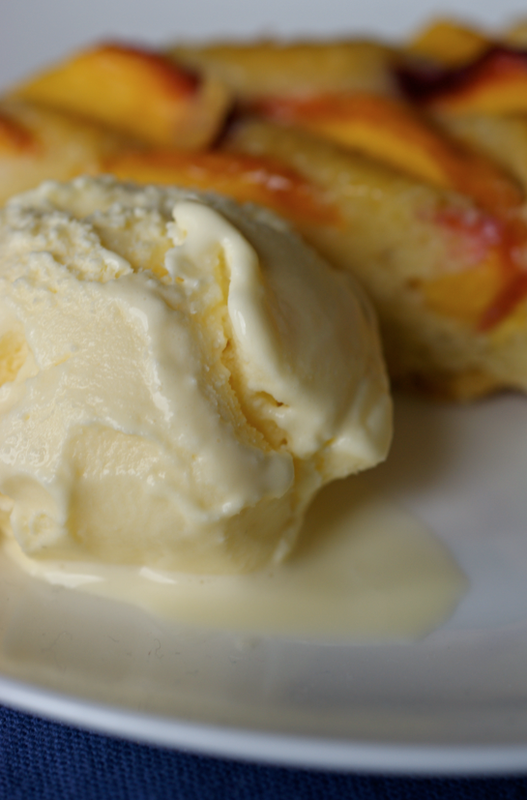 Your arrangement of peaches on the top is just beautiful. 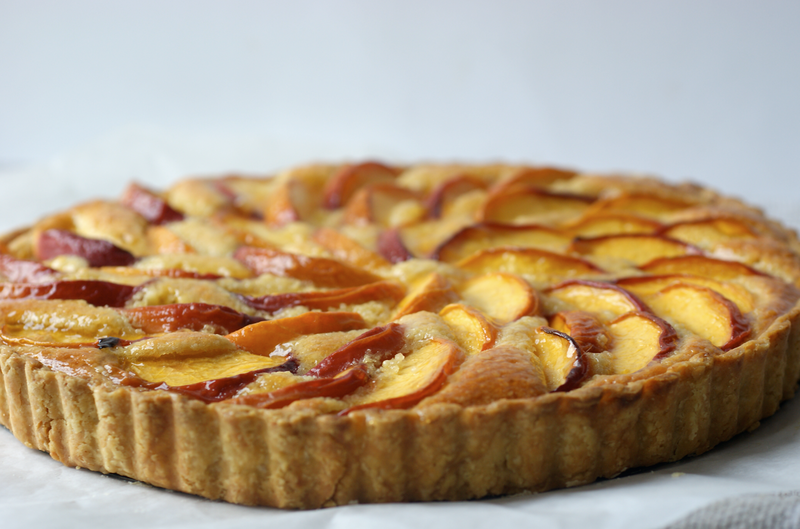 Im wondering if doughnut peaches and frangipane would be too sweet a combination?